Clerkenwell Design Week is an exciting time for us at Momentum as neighbours, creatives, brands and the like open their doors to showcase, exhibit, present, host talks or events and this year’s festival was no exception. Recently, we attended an insightful panel discussion on The Future of the Square Mile. The panel comprised of Simon Glynn, City of London’s Assistant Director of Public Realm, Jacob Loftus, CEO of General Projects and Gareth Banner, Managing Director of The Ned. Discussions were focused around shifting perceptions, committed developments, forecast growth and the challenges that the City faces. 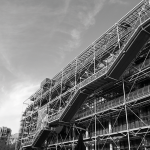 How can the City move away from being traditionally recognised as a Monday to Friday, 9-5 commercial (and predominantly financial) district towards a 24/7, seven day a week destination that is recognised for as much for its culture as it is for its commerce? What steps have already been taken and what else needs to happen for this change to really happen? Well, it’s already started. Developments such as One Poultry and The Ned are challenging the City’s norms. 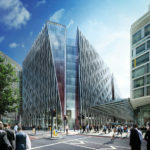 The former will bring creatives and individuals from a variety of backgrounds to the City as WeWork occupies the former financial building, whilst the latter is Soho House’s latest City venture which sees a former Bank converted to a hotel and members club with a diverse range of retail, restaurant and leisure spaces. 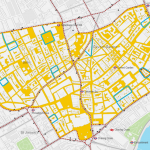 Alongside developments such as these, the City are taking their own steps with the introduction of the Culture Mile, a collaboration between the City of London and four key cultural institutions that seeks to transform public spaces within the borough through a series of events, pop-ups, art installations and so on. 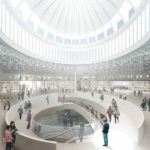 The relocation of the Museum of London to West Smithfield and the redevelopment of its current home as the Centre for Music will further establish the City as a cultural destination in its own right. What about the City’s infrastructure? 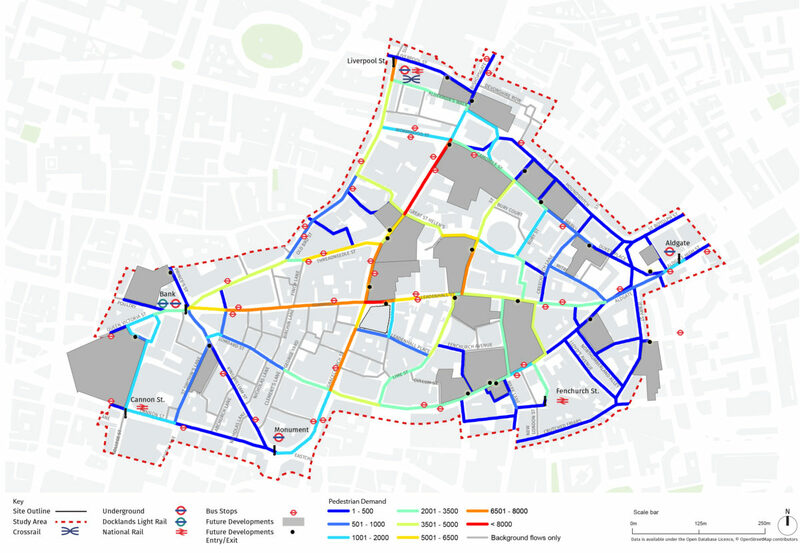 In-house rendering of a pedestrian studies map for 1 Leadenhall by Momentum. 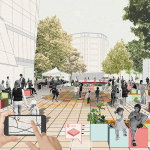 How will the introduction of Crossrail and the sheer volume of committed developments impact the City’s streets, spaces and public realm? The City currently has 10 of the 20 busiest pedestrian streets in Greater London, and that’s before Crossrail opens later this year. Alongside that, there is a 50% increase in development floor space coming forward with significant growth in areas such as the Eastern Cluster. The City acknowledges this issue and is taking steps to address this. 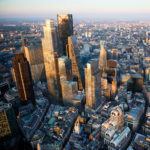 Examples include Crossrail urban realm improvements, Bank On Safety experimental scheme and the City’s Freight and Servicing Supplementary Planning Document. That’s not to say there isn’t more to be done and future developments and public realm schemes coming forward need to actively consider how to accommodate the demand and volume of people that the City will continue to generate. 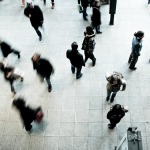 As a progressive, people-focused consultancy, we’re passionate about ensuring that public spaces within complex urban environments respond to the needs of the people who use them. We believe that careful planning, diligent design and the use of modelling enables us to create spaces that benefit the people that use them. 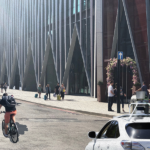 We’ve already put this into practice on a number of schemes in the City of London, such as 1 Leadenhall, and look forward to continuing to do so as the City evolves.